UPDATE 6/16: How funny is it that the picture for the True Blood article in this week's Entertainment Weekly has a similar concept? Beezaro! 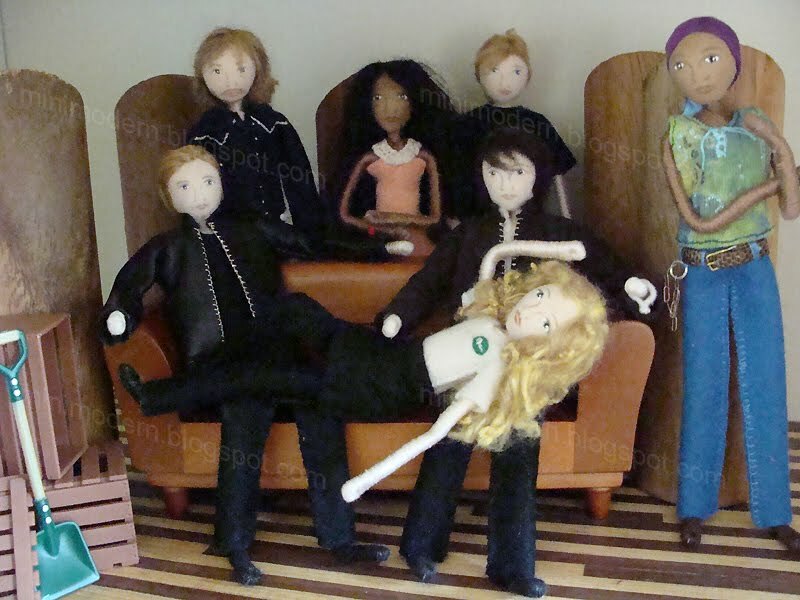 The Goods: True Blood dolls were made by Mary Colleen Eld of Silver Acorn; The sofa is Pottery Barn. All accessories are Mighty World. Oh! Yeah, that's what I should get too = some Burn Notice dolls. ha ha! I'm a fan of that show too. So happy to see a new post...I'm a House fan, myself. Nothing like a truly rude medicine man to brighten one's day. Miss you alot, MC! Thanks for the new post..a real treat. Your humor always comes thru. HA! Hmmm, I stopped watching vampire shows after Angel was canceled, maybe it's time to Netflix seasons 1 & 2 to get caught up. It would be nice to watch something less musical this summer. Joss Whedon directing Glee with NPH has been the hightlight of my TV viewing. Something darker would be fun. Thanks for the tip!!! Miss you! Hehehe - to cool ;D Nice to read you again! 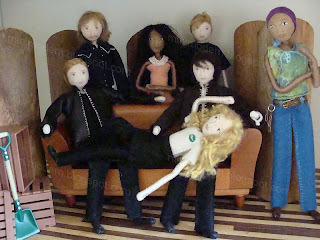 I LOVE the way you posed them with Sookie reclining on their laps- too perfect!